Docendo discimus is a Latin proverb; it means "by teaching, we learn". I spent a rewarding evening yesterday learning from members of the Cincinnati Chapter of the Professional Grounds Management Society (PGMS) while leading a diagnostic walk-about at Spring Grove Cemetery and Arboretum. Our first stop was to view a large oak sporting an "aerial display" of Porcelain-Berry (Ampelopsis glandulosa var. brevipedunculata; synonym Ampelopsis brevipedunculata). The porcelain-berry vine had sprouted from the junction of three forks of the main trunk about 20' above the ground. The "containerized" plant was doing very well and had grown over some of the lower branches of the oak; a dramatic demonstration of the tenacious nature of this non-native woody vine. The shiny, porcelain-like berries are now ripening to display their range of colors from pale blue to lilac to reddish-purple making porcelain-berry easy to identify. 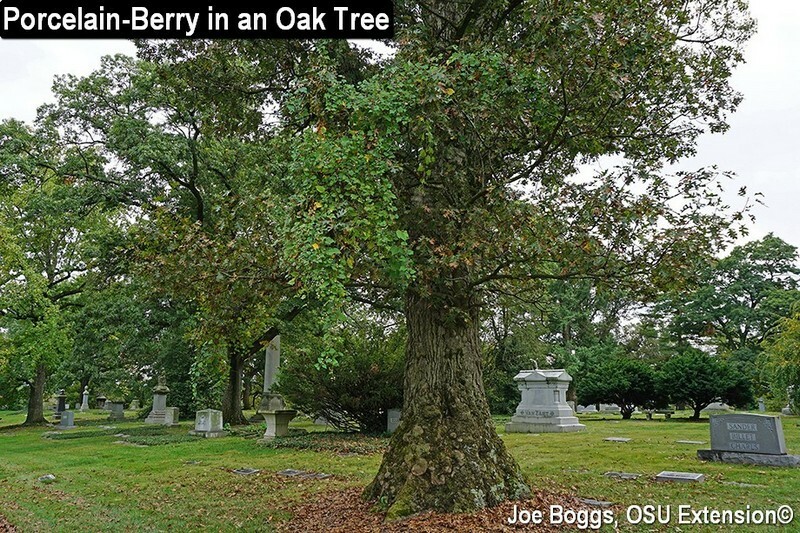 Our Spring Grove host, Dave Gressley (Director of Horticulture), noted that porcelain-berry has become widespread throughout the cemetery in recent years. Several other PGMS members echoed the observation giving locations throughout Greater Cincinnati. Indeed, our group came across a nearby herbaceous peony swathed in a porcelain-berry vine. Dave got too close and was soon enveloped by the invasive woody-vining beast. Who says learning can't be fun? My first experience observing the potential invasive nature of porcelain-berry came in 2014 while I was leading a monthly S.W. Ohio BYGLive! Diagnostic Walk-About in a county park. We came across a densely tangled vine overtopping a non-native bush honeysuckle (Lonicera spp.). I had no idea what the vine was until one of the walk-about participants identified it; by teaching, we learn. Since that time, porcelain-berry has spread throughout that park and commonly overtops shrubs and small trees. It's so dense in a number of locations that it reminds me of Kudzu (Pueraria montana var. lobata). Porcelain-berry belongs to the grape family, Vitaceae, and may be mistaken for wild grapes (Vitis spp.). It may also be mistaken for native members of the same genus including heartleaf peppervine (Ampelopsis cordata) which is native to the Southeast U.S.
Porcelain-berry is native to northeast Asia including China, Korea, Japan, and Russia. Various sources in the literature notes the plant was first introduced into the U.S. in the 1870's. Its vigorous growth habit and highly ornamental fruits (the "berry" in the common name) have long made it a favorite in landscape designs. In fact, you can still buy plants and seed. I came across this offer online, "Porcelain Berry Vine, Ampelopsis Brevipeduncula, 10 Seeds." "Fast Growth, Hardy, Adaptable, Easy to Grow, Climbing Vine, Showy Ornamental Fruit, Attracts Birds, Cold, Heat, Drought, Salt and Wind Tolerant." That's truth in advertising; a perfect description for an invasive plant! Perhaps the misspelling of the specific epithet was an attempt to mask aiding and abetting. Online references indicate that porcelain-berry is now considered an invasive plant in 12 states. The tendril-climbing vines colonize by prolific growth and seeds that are spread by water, birds, and other animals. It can rapidly overtop shrubs and small trees to reduce available light and its roots compete for water and nutrients. Once established, porcelain-berry is difficult to control due to its vigorous root system; ripping out vines may cause serious damage to the roots of preferred plants. There are no selective herbicides for porcelain-berry and its dense vining growth precludes the use of non-selective herbicides such as glyphosate (e.g. Roundup) unless the vines are pulled from infested plants, then sprayed so that any over-spray will not harm other plants. The best course of action is to not plant porcelain-berry in the first place. The second best action is to act quickly to pull-and-destroy young plants before they get a strong root-hold. I don't t know whether or not we're seeing another "kudzu" creeping over our landscapes. However, we shouldn't find out by doing nothing.